Curiosity is on the move this week as Mars recedes beyond 200 million miles (~321 million km) from Earth. The $2.5 billion rover is heading 300 ft. (~91m) down a slope to Yellowknife Bay while the rover's cameras and the eyes of its science team scan the terrain for the best rock and outcrop drilling targets to first test the drill then obtain subsurface samples. As it goes, the Curiosity science team is pondering the mystery behind the complex chemistry and a whiff of organics of undetermined origin found by the remarkable Sample Analysis at Mars (SAM) instrument in its first assessment of Martian sand. About 5,600 miles (~9012km) away, Opportunity's cameras have also been scanning just as intently for its science team trying to lay eyes on outcrops or rocks that may be harboring ancient mineral laden clays, a type of hydrous phyllosilicate that presumably would have formed in non-acidic, more Earth-like water. The mystery is - where are they? Although data from the Mars Reconnaissance Orbiter indicates they are somewhere right beneath the rover's wheels, the science team is hampered because Opportunity's mineral detecting spectrometers are no longer functioning. So, like detectives, the team is sleuthing through the terrain. The recent brouhaha about Curiosity's findings, and the overwhelming response to Spirit and Opportunity before the large new rover came on the scene, clearly show the public has a real interest in Mars - and most of all life on Mars. But help is on the way to accelerate the search for evidence of alien life forms. The White House has agreed to support a NASA request to develop and launch in 2020 a second one ton nuclear powered Mars Science Laboratory (MSL) type rover that will land in 2021 using the same Sky Crane system pioneered by Curiosity. The current search for evidence of possibly life related organic carbon on Mars is the responsibility of Curiosity's $90 million SAM instrument suite that includes a mass spectrometer, gas chromatograph, and tunable laser spectrometer. "SAM made [a] detection of organic compounds, simple organic compounds," said John Grotzinger, Curiosity project scientist from the California Institute of Technology. "We simply don't know if they are indigenous to Mars or not. So it is going to take us some time to work through that," he said this week at the American Geophysical Union (AGU) conference in San Francisco. "We see very simple chlorinated hydrocarbons and clearly detected them," said Paul Mahaffy, the SAM principal investigator from the Goddard Space Flight Center. "But the reason we say we have no definitive detection of Martian organics is that we have to be very careful to make sure that both the carbon and the chlorine are from Mars, not residual terrestrial carbons in our system," he said. A tiny pinch of Martian sand was heated to about 1,500 deg F (~816C) within the SAM instrument. The soil out gassed with results that initially caused a sensation about potential Mars life spread by hair-trigger web sites and some national media. This happened after Grotzinger commented saying SAM results were "going to make the history books" in the presence of Joe Palka an experienced National Public Radio science writer. He broadcast the exchange, raising the possible discovery of organics related to life. 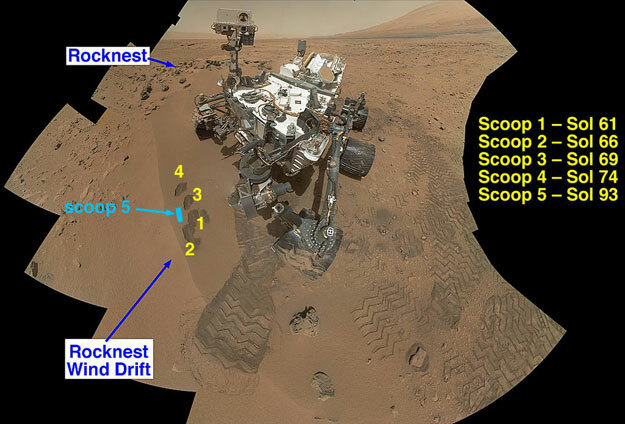 Curiosity mosaic captured with MAHLI camera on fully extended 7 ft. arm shows annotated scoop marks in sand dune. Credit: NASA/JPL. Grotzinger said at the AGU he was actually commenting about how SAM was repeating the analysis with the same result, a capability vital to science data verification. "You have got to be careful what you say and even more careful about how you say it. We are doing science at the [slow] speed of science. But in a world of "instagrams" the enthusiasm that I had was just misunderstood," he said. The Jet Propulsion Laboratory Public Affairs Office then reacted weakly and too late to knock the Mars life stories down before they spread globally. Curiosity found perchlorate in the sand as did the Phoenix North Polar lander in 2008. "There is every expectation the carbon came from a perchlorate compound," Mahaffy said. --Are they Martian?-- "Even though SAM detected organic compounds, first we have to demonstrate that they are indigenous to Mars," said Grotzinger. --Are they from space?-- "After that we have to engage in the question of whether they represent the background fall of cosmic material, organic in composition, that fall on the surface of every terrestrial planet". ---Any evidence of biological origin?-- "Then we can get into whether this might represent a biological material. But that is well, well down the road for us," Grotzinger said. He also said the context in which this and any other sample was obtained as determined by the input of all the other instruments on the rover would also be key in assessing SAM data. The possibility the data in this case could be biological is virtually impossible said two other highly experienced Mars researchers interviewed by CuriousMars. "What this mission is about is integrated science. There is not going to be one single point where we all stand up and on the basis of a single measurement have a hallelujah moment. We will pull it all together and take our time and if we have found something significant we will be happy to report that," Grotzinger said. For Opportunity the hunt for ancient clays and ancient environments at Endeavour crater is like a whole new mission for the rover, nearing the 9th anniversary of its airbag landing on Mars in January, 2004. The challenge with Opportunity is how to identify the important clays the science team knows must be around Endeavour crater with a rover that still has great imaging systems, a chemical detecting instrument and a good grinder, but two failed spectrometers. The Mars Exploration Rover Opportunity made this mosaic of itself heavily covered with dust around Christmas 2011 near Endeavour crater. Martian winds have since blown most of it off. Credit: NASA/JPL. The finding of phyllosilicates is hugely important to both Opportunity and Curiosity (which will be searching for them on Mt. Sharp ) because they hold the good chance of containing evidence of a past environment on Mars that could have been a haven for the emergence of life. This is because more than 3 billion years ago these minerals were forming in warmer, non-acidic - and many say abundant - water conditions different than the ancient highly acidic water environments for which both Spirit and Opportunity found solid evidence. Although Opportunity's team has yet to actually see the clays, it would appear the robot field geologist is roving on top of them. "This is our first glimpse ever at conditions on ancient Mars that clearly show us a chemistry that would have been suitable for life at the Opportunity site," principal investigator Steve Squyres of Cornell University said at the AGU meeting. 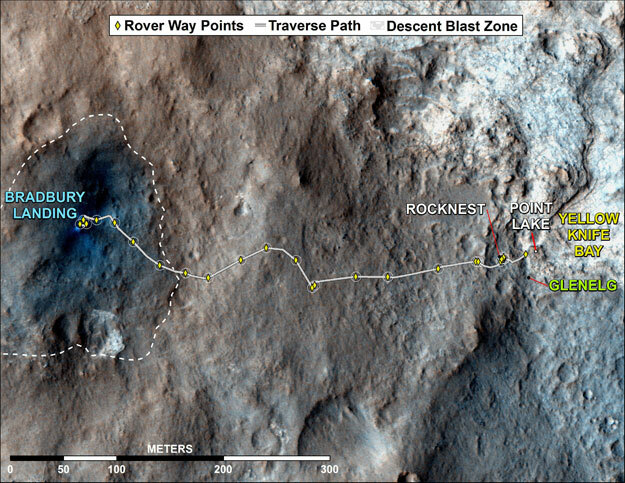 Opportunity, and the now silent Spirit rover, were equipped to search for evidence of past water. Each made history with multiple water related geology discoveries. Now the surviving twin is moving beyond its official 'Follow the Water' directive and cruising to the next level of NASA's Mars Program architecture, 'Determine Habitability' - which, actually, is what Curiosity is assigned to do. The two missions are "now complementary," because the grand goal is to understand Mars and its past history, noted Ray Arvidson, Opportunity deputy principal investigator from Washington University St. Louis, and like Squyres also a Curiosity team member. 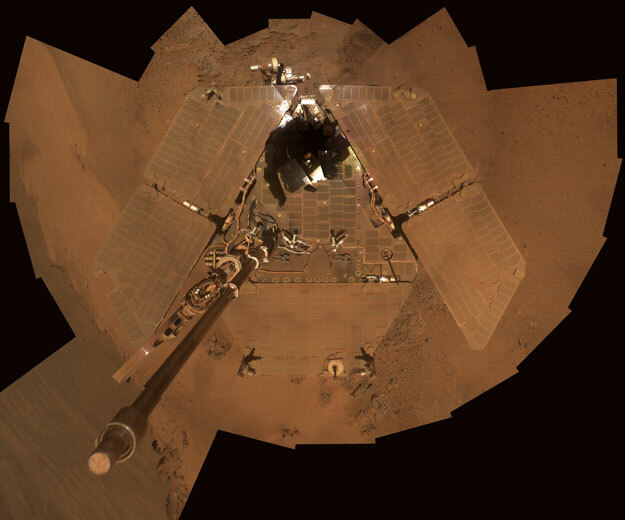 "Opportunity is now exploring in an area we think has clay minerals and what we learn will 'feed back' into campaigns with Curiosity," he said. More on Opportunity's "new mission" in next week's CuriousMars feature on SpaceRef. The instruments on the new 2020 rover will be different on this second long life rover and could include a capability designed to directly detect current Martian life as well as a system to select and cache high priority samples for eventual return to Earth for analysis of potential life indications. 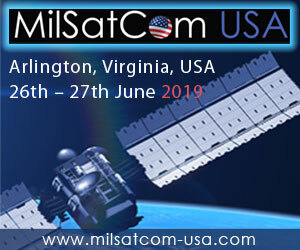 A Life Marker Chip (LMC) system being developed in Britain by Leicester and Cranfield University personnel could compete in a forthcoming instrument selection for the 2020 rover, said John Grunsfeld, NASA Associate Administrator for Science. If the LMC were to be selected and then successful, the British space program, considered by many to be an oxymoron, could possibly end up making the most important finding in the history of space exploration! A "life detector" on the 2020 rover would be the first such instrument on a U. S. Mars mission since the twin 1976 Viking landers'. The 2020 robotic mission will be developed in coordination with NASA's human exploration program to begin a series of unmanned flights that will build toward a robotic Martian sample return mission by the late 2020s. NASA's Mars Program Planning Group recommended that the rovers be a combination of MSL types and more capable versions of the Mars Exploration Rover design like Spirit and Opportunity. This would lead into the first manned mission to Martian orbit in the 2030s, that could also rendezvous with and return samples to Earth. 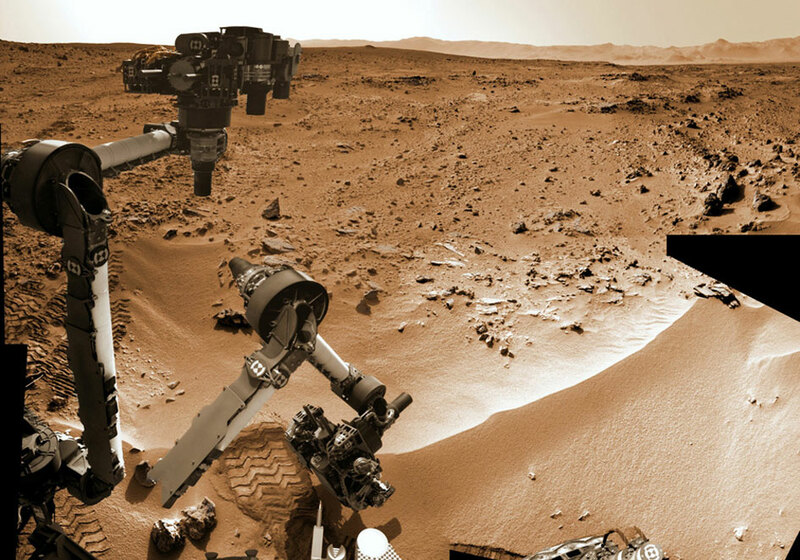 The robotic collaboration with the manned program is already underway on the Curiosity mission in Gale crater where the Southwest Research Institute's Radiation Assessment Detector (RAD) is continually documenting the radiation environment that will threaten future astronauts on Mars. Early radiation findings by RAD prompted many web sites and media outlets to report that "radiation would be no problem" to astronauts on Mars. Grunsfeld, an astronomer astronaut who has flown in space five times, including three missions to the Hubble Space Telescope has a sharply different view. "We are very afraid of space radiation, especially galactic cosmic radiation," Grunsfeld said, stressing RAD's importance. Cosmic radiation is "a that we have to learn more about before we go out there to Mars, he said at the AGU Dec. 4 when announcing the new rover plan. Meanwhile Curiosity's science team is proud of its data and even prouder that all of its complex instruments are working perfectly for the intense exploration that lies ahead. Panorama of scoop marks taken on Sol 93 two weeks ago show the precision of the robotic scoop to repeat exact depth of scoops. Credit: NASA/JPL-Caltech/MSSS/Marco Di Lorenzo/www.KenKremer.com. Grotzinger said the immediate plan for Curiosity is to reach Yellowknife Bay and to finish drilling hopefully by Christmas so the big rover can begin its drive to Mt. Sharp by January. The site was picked using Mars Reconnaissance Orbiter and Curiosity long range images, as the target area for first use of its critical rock drill. As the rover approaches closer and closer, the science team will tradeoff imaging and instrument data about which rocks or outcrops to drill with engineering assessments of rover stability and arm approach angles to safely drill the targets selected. "It is a pretty involved dance going from wanting to drill a target to that first time operation. 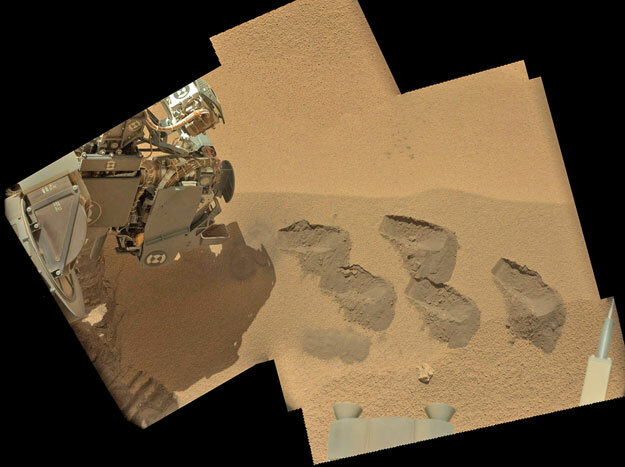 We think we have the process and procedures in place to do that in a pretty timely fashion," said Joel Hurowitz with the Curiosity Surface Sampling System (SSS) Team. The team hopes to drill one or more rock targets to a depth of up to 2 in. deep to deliver a powered sample of the rocks' internal makeup to the spectrometers in SAM instrument and the ChemMin X-ray diffraction instrument. months of sustained driving to reach the layered flanks of 15,000 ft. (4572m) Mt. Sharp where the potential for organic carbon resulted in selection of Gale crater as Curiosity's landing site. "The drilling target selection process is like building a pyramid," Hurowitz told CuriousMars. "We start at the basic level of what do the rocks look like in imaging data and which ones appear most scientifically interesting as things we would want to collect samples from for our analytical instruments. Factoring into that is the texture of the rock, the geological context in which it positioned and whether it looks like a sedimentary rock that may have been deposited in a water bearing environment, or a volcanic rock. Map plots the traverse from landing at left to the final drive down toward significantly different geologic terrain into Yellowknife Bay at far right. Credit: NASA/JPL. He said there is a narrowing process underway as the rover approaches more closely to Yellowknife Bay. Images of large outcrops and rocks are being analyzed, but much smaller spots on those features are also being defined from a geologic perspective and whether they look like a rock that will hold together well under the strain of the drill. "An important part of that process is that once we move beyond answering the question of whether or not it is scientifically interesting we now need to do the engineering assessment of whether we can now physically place the drill down on that target and get a sample out of it," Hurowitz said. "That is a something we have to do on a case by case basis. We have to drive up to within a meter or two of the potential drill target and collect stereo images so that we can build a graphic terrain mesh in our computer software," he told CuriousMars. To reaffirm that it is a scientifically worthy target the Los Alamos ChemCam laser to measure basic composition will be used on the target when the rover is within 10-15 ft. (3-5m), while the arm will place the Alpha Particle X-ray Spectrometer directly on the target and extremely close up images of the target's surface will be obtained with the MAHLI Mars Hand Lens Imager. --Rover footing and stability-- To assess if the rover is going to have a stable, relatively flat place to park in front of the target such that when the arm and turret with the drill is pressed down onto the rock, that action is not going to cause the rover to slip or move around as the arm interacts with the drill target. --Drill bit stability-- At an even finer level of detail the SSS team needs to understand what is the roughness of the rock target, and will it be possible to get the contact prongs on either side of the drill bit itself into a good solid placement. This is important so that the mass of the rover in part carried by the arm can force the drill tightly against the rock to enable extending the drill bit down against the rock and begin the percussion drilling operations. "So there is a process of building from images that are taken far away, selecting targets that look interesting, getting close up to the rock, doing the engineering assessments of whether or not it is actually possible to drill that rock and then proceeding with the drilling operation," Hurowitz said. The rotary percussion drill has two long support rods that will help position the drill bit against the rock target. The several inch long drill bit itself has spiral blades etched into its outer surface. It is encased in a hollow sleeve that allows the rotating motion of the drill bit to transport pulverized rock up into two chambers on either side of the drill's interface with the rover's instrument turret. 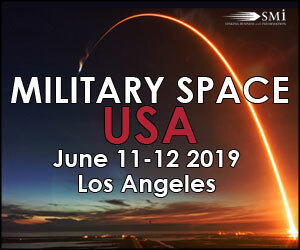 Seals made of Teflon, fiberglass and molybdenum are used in the chambers, a design that raised concern before launch when the Teflon was found to be a source of contamination. That will supposedly be accounted for in sample analysis of rock dust from the drill. The robotic arm will elevate the instrument turret to pour the drill's tiny samples into the SAM and CheMin instruments for the first analysis of subsurface material on Mars. Today SpaceRef debuts a major new weekly feature, CuriousMars, with authoritative and insightful reporting and analysis on all aspects of current and future robotic operations on the Martian surface and in Martian orbit. 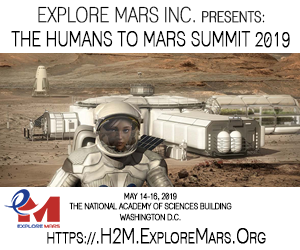 CuriousMars will report on the adventure of exploration and science combined with the realities of policy, cost, politics and international cooperation. This new feature is based on solid journalism by its editors' Craig Covault and A.J.S. Rayl. Covault has 43 years of award winning international space writing experience including 36 years at Aviation Week and Space Technology. He has written on space from 20 countries and covered 17 U. S. and Russian Mars missions, embedding for days with the Spirit and Opportunity science teams. A.J.S. Rayl has been space and science writing for nearly 30 years. For the last 9 years she has written a detailed monthly chronology of Spirit and Opportunity's operations on Mars for The Planetary Society. She spent 10 years as a regular space and science contributor to OMNI Magazine and has also written for Air & Space, Astronomy, Discover, The Los Angeles Times, Reader's Digest, Smithsonian, The Scientist, and Wired.